We're starting a new series here at HTV! It's a husband/wife advice column called We Thought You'd Never Ask, and you lovely folks are invited to submit topics or questions! Then, my (extremely opinionated) husband and I will discuss them, by which I mean we'll battle it out for your amusement to determine who is right, and who has to bow down in deference to the other person's stellar debate skills. Or maybe we'll just determine who is right and who is right (because neither of us will actually ever admit to being wrong). Yippee! We're taking submissions for anything you'd like to see us argue about discuss - from major world issues to input on how to get somebody else to change the kitty litter. Share them in the comments or email to me at hollowtreeventures @ gmail dot com (take THAT, spammers who don't know how to remove spaces) - it's the most fun way to get our worthless yet hilarious opinions and advice, which I know will be a great relief to those of you who've been clamoring for our worthless yet hilarious opinions and advice. Next week we'll feature our first question, a holiday-themed Christmas light query sent to us by Ellen and Erin of The Sisterhood of the Sensible Moms. But first, as a warm-up, here's the debate my hubs, Gerry, and I had about this debate. Gerry: We need two things: a catchy title, and topics! Robyn: Okay, but three things - we also need to decide how to set it up. Should we go back and forth, or each write our own side, followed by a conclusion, or what? Gerry: It figures. Of course you want to make a bunch of rules. Robyn: Duh. Of course we need rules! If we don't have rules, how will we know when we're breaking them? How will we know when we're doing it right?!? The funny business: to help you out during the holidays, I wrote a guide to table manners you do NOT want to miss, even if you just need to print it out for Uncle Hal (and his breath). But the holidays are more than just meals; if you're doing some Christmas shopping, you know it's hard enough buying for The Person Who Has Everything - but what about the person who has NOTHING? You'll want to check out my gift guide for lonely people to find out what they might appreciate (as long as they have a sense of humor). Tired of hearing about those tired old holidays? Kick back and relax with my report on porny pillows! Or snuggle up with the kids and scar them for life with some terrifying Little Golden Books. First, I published another felt food tutorial, this time for a complete sandwich set. I gave a bunch of felt food to my oldest daughter for Christmas a few years ago, and the kids still play with it every day, so I can tell you from experience that you still have time before Christmas to whip up a super-cheap, super-cool homemade gift for your kids or grandkids that'll last through at least forty zillion pretend lunches. Then, since you're going to need to unwind after all this shopping and making stuff and dealing with family, I shared my secret to unlimited parental free time: the spy scavenger hunt! I've done 99% of the prep work for you, so click over (or pin it for later) so you, too, can enjoy some well-deserved peace and quiet. 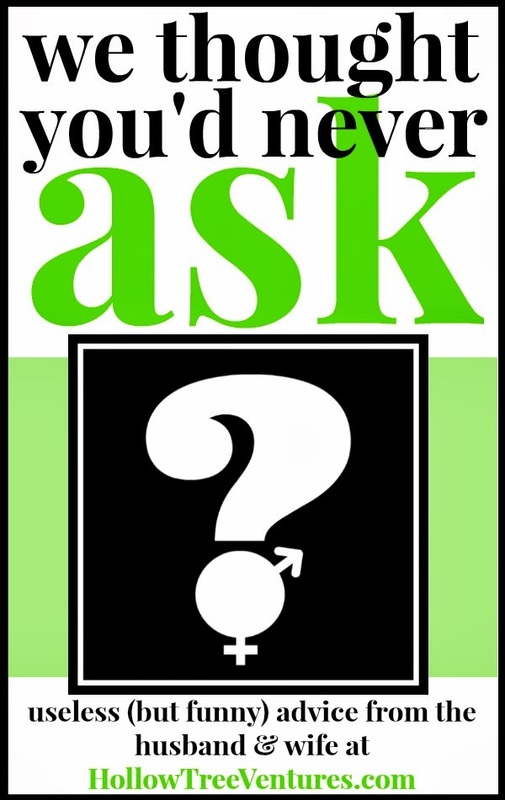 Dear Never Ask: We've been married 58 years & my husband is pushing me to consummate our marriage. I'm not ready because I'm still not sure if the marriage will work out. What do you suggest? Fishducky, the hubs claims to have a lot to say on this subject - I can hardly wait. Until then, hang in there! GOOD QUESTION - I can't wait to bring this one up for discussion. The dishwasher is like an unspoken horror around here, so it should get interesting (unless he picks that last option, in which case things are gonna get ugly). I can't believe I wasted my time reading the rant of what seems to me to be an idiot trying way to hard to be pissed at what ever company they deal with. Thank you, Bored from this post, to waste the *additional* time needed to share your opinion on this article, the content and tone of which was pretty clearly expressed in the title so as to avoid any unpleasant surprises. Or so this idiot had hoped. I assume by "Battle it out" you mean, "Pretend to listen, then tell him why he's wrong?" Just checking.